The global decline of bee populations has been well-publicized of late.An entire subsection of The Environmental Protection Agency’s website documents the decline of bee populations since 2006. A phenomenon called colony collapse disorder (CCD) is a significant contributing factor. Rain garden built by Kaleidoscope Landscape with rudbeckia, coneflower, lavender, blueberry, and heather—all pollinator-friendly plants. The causes of CCD elude scientists, although the suspect lack of habitat and pesticide use contribute to the problem. But that’s just a piece of the puzzle. More recently, The Washington Post reported insecticidal sprays intended to wipe out mosquitoes carrying the Zika virus has decimated pollinator populations as well. The Xerces Society, a Portland-based environmental education group, have extensively documented the pernicious effects of a group of common agricultural pesticides called neonicotinoids on pollinator populations. The importance of bees in food production (and evidence that pollinating bees rarely sting unless harassed) is thoroughly documented elsewhere. Suffice it to say that if you enjoy fruits and veggies, you have nothing to fear from bees. In fact, it behooves you to support the continued survival of bees. The best action you can take is to decrease or eliminate your use of pesticides. The second-best thing you can do is plant more flowers. Habitat fragmentation, which constitutes an insufficiency of pollen and nectar filled flowers that bees enjoy eating, is another key contributor to their decline. For the record, let’s be clear: I’m speaking in generalities. Globally, there are about 4000 different bee species, each with different flower preferences and ranging habits. However, many species tend to range significant distances in search of food, and they need frequent access to flowers they enjoy in order survive. If they don’t stop to “refuel” every so often, they’ll succumb to exhaustion and die. As homeowners, landscapers, and flower-lovers, creating foraging areas for bees is mutually beneficial. Strategic planting of hardy, pollinator-friendly perennials well-adapted to the prevailing climatic conditions beautifies and landscape and feeds the pollinators. Such planting also has the potential to improve the yields of fruit and vegetables grown nearby, and surrounding yourself with beautiful flora is a sure-fire way to lower stress levels. 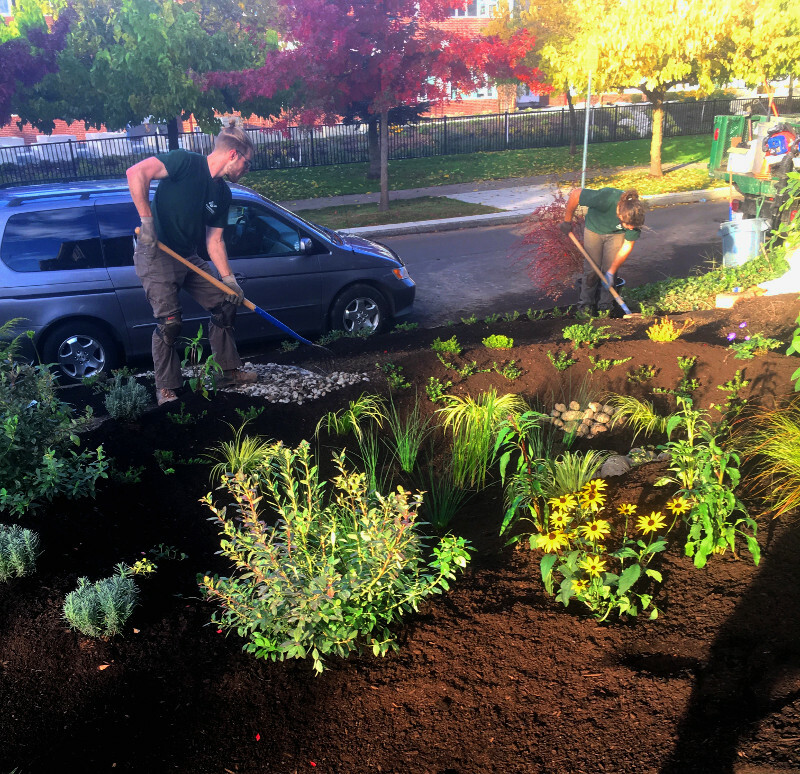 We at Kaleidoscope Landscape have put some thought into how our company can help pollinators thrive in the Greater Seattle area. In the past, we’ve built a number of rain-gardens that double pollinator forage islands. More recently, we’ve been experimenting with installing suites of perennials that flower sequentially from early spring though late fall. Staggering bloom times across the growing season guarantees the bees something to eat, extending the temporal range of their pollination activities. If you have any interest in working with us to preserve Seattle pollinator populations, don’t hesitate to reach out!